Kota Kinabalu, formerly Jesselton, is the capital of Sabah state in Malaysia. It is also the capital of the West Coast Division of Sabah. The city is located on the northwest coast of Borneo facing the South China Sea. The Tunku Abdul Rahman Marine Park lies on one side and Mount Kinabalu, which gave the city its name, is nearby. Kota Kinabalu proper has a population of 579,304, while the larger urban area has an estimated population of 700,000. It is the largest urban centre in Sabah and the sixth largest in Malaysia. Kota Kinabalu is often known as K.K. within Malaysia and internationally. It is a major tourist destination and a popular gateway for travellers visiting Sabah and Borneo. Kinabalu Park is located about 90 kilometres from the city and there are many tourist attractions in and around the city. 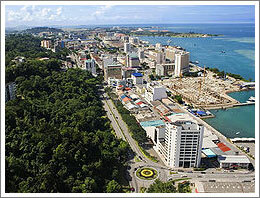 Kota Kinabalu is also one of the major industrial and commercial centres of East Malaysia. These two factors combine to make Kota Kinabalu one of the fastest growing cities in Malaysia.